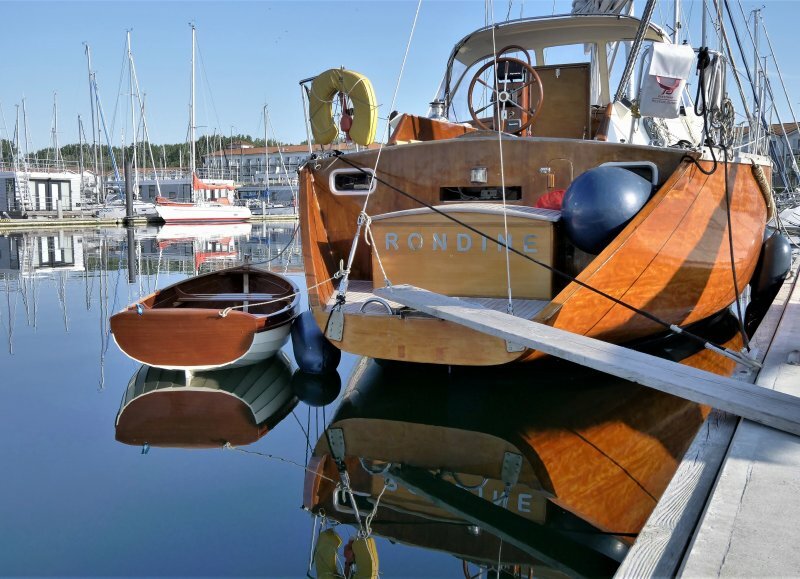 This Auklet has been built last Winter by Ernst (54) und Tristan Glas (9) as a tender to their wooden sailing boat Rondine, a 13m sloop, finished in 1993. The Auklet is now sailing at rondines foredeck. It is made of 4mm Mahogany plywood, a solid 3cm transom of Mahogany to carry the electric outbord and longitudinals and bottom floor of ash. Thwarts ar made of stripes of Mahogany and Ash. It is glued with West System Epoxy and coated with the same Epoxy and Epifanes 2-component-varnish and paint. It’s not as light as it could be, due to some solid Mahogany reinforcements, the transom and a solid coating. So the total weight is approximately 40 kg. The boat is very stiff and good to handle with oars, it is fast and stable and able to carry 2 adults and a child in quiet waters. The Electric outboard of 1600W is a bit overpowered, approx half power is delivering hull speed already, so there are some resources in case of strong winds. The boat is light enough to be pulled up on to the hull on Rondines deck by hand. It has become a good companion and Ernst and Tristan hope, it will be for a long time. Building the Auklet was a joy, maybe the next boat has to be built soon. It has not yet a name, maybe it will find one over time.